Know They'll Actually Read It! Within mere moments, you'll discover how you could have dozens of the biggest gurus around devouring your JV offers! Gain The Inside Affiliate Edge By Finding Out About ALL Of The Big Product Launches Before Your Competition! Internet marketing can be a tricky business. There are so many things that you have to be great at in order to succeed. You have to be able to have a great product, get tons of traffic, have a huge responsive mailing list, the ability to market well, the skills to network, etc..
You can have the greatest product around -- I'm sure some of you already do. However, that doesn't amount to anything. An inferior product can still easily beat you out if it has the other parts of the formula to success in place that you're missing. The biggest part of whether or not your newest, greatest product will make a fortune or utterly fail and disappoint is your ability to get other big names with huge mailing lists to promote your products. Easy, right? Doing this sounds much easier than it is. First, you have to know who these big names are with their highly responsive mailing lists. Even if you have a good list of names, you have to be able to grab their attention and get them to consider your offer. Most of these guys get dozens of offers each day, and you can bet that they probably ignore every single one. They have their own networks of other marketers to promote and they rarely look at offers that are unsolicited -- and with good reason. Most of these offers are either complete crap or filled with spam. They don't have time to sort the good from the bad, so chances are that they ignore practically all of them. If only just a handful of them would promise to look over your offer, you can bet that your fortunes would probably change, right? Introducing JV Submitter, the solution to your online success. Hi, my name is Brian "Koz" Kosobucki. I'm an internet marketer that has been making a very nice living online for the past couple of years. Sure, I'll be honest -- I'm relatively new, but in that time, I've established a multiple income stream online business with several workers helping me out, setup a series of internet marketing seminars with Ross Goldberg and myself hosting them, created some awesome first-of-a-kind products and memberships, and showed how virtually anyone can skyrocket their business literally overnight. Even with a great team of designers, writers, and programmers, which I owe a portion of my success to, there has been one HUGE part to my success -- teaming up with other marketers willing to promote my products is the one thing that I had personally been missing until recently. This is also known as creating joint ventures, or JV's as many of us like to call it. And believe me, I know how hard that can be! I didn't have it easy. I didn't have hordes of other marketers banging on my doors asking to promote my products -- at least not at the start. It wasn't until I started networking more that I realized how powerful this big part of the equation really is. I was fortunate enough to get an inside view of things, met some other great marketers, and realized one thing -- all of these other marketers are hungry to promote other products! Seriously, think about it. That's how they make their fortunes. They promote others' products, make tons of money off of all of their sales, and then they can rely on their inner circles to promote their stuff whenever it's ready. They're willing to listen to outside offers, but they don't have time to sift through all the crap they get! What if, with one click of a button, the biggest names in the industry would get a list of quality offers from others that have good products and just need some extra exposure?!? You can bet that I ran with that idea, talked to several other marketers, and the consensus I received amazed me -- they'd love to be able to glance at a list of good offers from others. They want to have good products to promote and make money off of. The only reason they ignore all those JV offers are that 99% of them are pure crap and spam. Something amazing then happened. I called up Ross and told him about this idea and he loved it. He called all of his guru buddies and told them about JV Submitter, and they all loved it too! Several of the biggest names in the industry -- many with mailing lists in the hundreds of thousands -- agreed to review your offers once every two weeks through a single newsletter e-mail that they agreed to open and read provided that I weed out the pure spam offers and keep only the good ones. At that very moment, JV Submitter was concieved. Put your offer in front of dozens of the biggest names in the industry directly into their inbox! Not only have a short ad describing your JV proposal, but also have links to more detailed information that they can read up on. Separate your offers from the other crap that the gurus get every day. Have your offer(s) seen once every two weeks (you can put new offers in place of your old ones whenever you want). Finally get recognized in the inner circles of internet marketing. Get Unlimited JV posts in the viewer protected, members only forum. Have the edge on other affiliates by knowing about the best products online weeks before they ever know they exist. Who are these big names? Well, you won't be seeing a whole list -- several of them don't want the spotlight. But I promise you that if you think of a list of the top ten marketers, most likely you'll see most, if not all, of them here. There are even big name list brokers (with access to dozens of huge mailing lists from other gurus) and even affiliate managers (their very job is to go through these offers) on this extensive list! Willie Crawford: Willie has been online for 10 years, spoken at major internet marketing seminars and is one of the most well known JV brokers in the industry. Ewen Chia: Ewen is widely known as the "World's #1 Super Affiliate" and his name is synonymous with affiliate marketing. His list is over 300,000 subscribers big, and he is also well known for starting an internet business from scratch and generating $80,000 in 3 days LIVE in front of an audience. Mike Merz: Mike was the JV broker behind the 1.5 Million dollar Butterfly Marketing launch. He also runs one of the most popular joint venture networks online. Dr. Mani: Dr. Mani Sivasubramanian has helped hundreds of achievers build information empires. He runs the popular free Internet Infopreneur Tips ezine. Brian Edmondson: Brian came out of nowhere to become one of the top affiliates for the Butterfly Marketing launch with a list of only 1200 people! Simon Leung: Simon worked for Google in the Adwords department and headed up multiple departments during his tenure. Simon speaks at tons of internet marketing seminars and is one of the brightest minds in the internet marketing field. Jason James: Jason started his online business on Ebay during service in the U.S. Marines. His last 5 launches each broke 6 figures with ease. Jeff Dedrick: Jeff is constantly the top affiliate for nearly any product he promotes. He has tons of connections and always makes a huge impact as an affiliate. Jeff's Hidden Sales Project launched to huge critical acclaim and sales to become one of the most widely promoted products of this year! All in all, there are literally dozens of other gurus on this list. Best of all, these gurus HAVE AGREED TO READ ALL OF YOUR OFFERS! You won't be able to get such a great list of internet marketers agreeing to look over your offer anywhere else -- I can promise you that. Now, I'm going to be honest with you. I'm not going to allow pure crap to get on this list, as I made that promise to the gurus -- that's why JV Submitter works so well. If you're selling a guide for $500 that just says "create a mailing list" with not much else, you're not going to have any luck here, and you'll receive a full refund. If you're writing a guide and claiming to make millions, yet you can't afford anything but a free hosting account with banner ads all over, you're also not going to have a chance of getting on this list. Remember, that's why these gurus don't look over all those other offers they receive every single day. Pure crap like that ruins it for everyone else. Even if you have a good product, don't think that you'll get a lot of takers when you offer a 5% cut of your profits to potential guru affiliates. Don't waste their time. They have the potential to make you a fortune -- don't try to act as though they should promote your stuff without a good cut of the profits. The better you can present your offers, and the more appealing they appear to be, the more chance you'll have for success. If you're on the same boat as me and agree, then great! We'll give you the exact format that will best serve you when you put your offers in front of these millionaires. This formula will ensure you get the best results from every offer you submit using JV Submitter. Sounds great! How much is this gigantic opportunity!? How much are you expecting to pay for this? Keep in mind that if just one of these big honchos promote your product, they could bring you thousands to even tens of thousands of dollars. Some exclusive JV membership sites that only offer a forum (forcing the gurus to go to them instead -- good luck with that!) charge close to $100 or more per month. 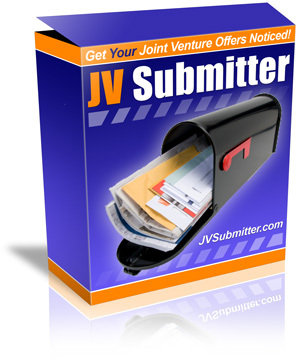 JV Submitter is not only far less, but it also brings your offers to the gurus front doorstep -- their e-mail inboxes! You're going to get one heck of a deal today. For a one time fee of only $47, you can sign-up for JV Submitter and get your JV offers in front of these gurus up to twice a month. Even better, you can continue getting new proposals to the gurus each and every month for only $19.95 per month after your first month. That's a savings of nearly 60% after the first month. Now, this fee has a dual purpose. Not only are the fees meant to cover this site's own costs and marketing, but the $47 is also meant to weed out those with crappy, fake, and scam filled offers from applying. I don't have time to waste on tons of crap offers coming in, nor do I want to jeopardize all the great offers that will be on JV Submitter. Trust me, this is here to benefit all of us. And don't worry about the list being so big that your offer gets lost. All new offers will get moved to the top of the list, and the same repeat offers will either get moved down or encouraged to switch to a new offer. Afterall, the list has to stay fresh if you want to have it appealing to the gurus. So don't delay and start getting the exposure (and cold hard cash) you deserve! Only $47 the first month and $19.95 each month after for a limited time! Insane Bonus #1 -- To make this an even more awesome offer, after purchasing your JV Submitter membership, you'll have the opportunity to have any short text ad with a link of your choice e-mailed out with other offers once every two weeks to other customers of JV Submitter who also want to partake in this amazing opportunity to get exposure to the other up and coming members. Every time I mail out to the gurus with your JV proposals, you'll receive an e-mail from me confirming it along with a list of ads from you and others. Some great extra exposure and sales opportunities for you! Insane Bonus #2 -- To make this membership even more rewarding for you, all members will have access to our exclusive JV forum where you can network with other marketers, learn how to improve your chances for success, gain more affiliates, and submit even more JV offers. Insane Bonus #3 -- In addition to your JV offers going straight to the inboxes of some of the biggest names in internet marketing, we'll also show your JV offers (if you wish) on our popular JV blog for the whole world to see. This will serve as a great way to increase your exposure even more. Scroll Back Up and Sign Up Now! P.S. Remember that this is unlike any other JV opportunity. Your offers will not only show up on the forums, but more importantly, they will appear in the gurus' personal e-mail inboxes that they've agreed to read! P.P.S. The benefit of this service is actually even higher for an affiliate (which most product creators are anyways). Finding out about the newest and hottest products before they launch will increase your revenues as much as 41%! We've tested this and that was the amount of extra sales we got simply by taking action and being the first to know! EVERY EFFORT HAS BEEN MADE TO ACCURATELY REPRESENT THIS MEMBERSHIP SITE AND IT'S POTENTIAL. EVEN THOUGH THIS INDUSTRY IS ONE OF THE FEW WHERE ONE CAN WRITE THEIR OWN CHECK IN TERMS OF EARNINGS, THERE IS NO GUARANTEE THAT YOU WILL EARN ANY MONEY USING THIS SERVICE OR ANY OF THE TECHNIQUES AND IDEAS IN THESE MATERIALS. EXAMPLES IN THESE MATERIALS ARE NOT TO BE INTERPRETED AS A PROMISE OR GUARANTEE OF EARNINGS. EARNING POTENTIAL IS ENTIRELY DEPENDENT ON THE PERSON USING OUR MEMBERSHIP, PRODUCT, IDEAS AND TECHNIQUES. WE DO NOT PURPORT THIS AS A "GET RICH SCHEME." EXAMPLES OF EARNING POTENTIAL STATED ARE NOT GUARANTEED. YOUR LEVEL OF SUCCESS IN ATTAINING THE RESULTS SHOWN IN THE EXAMPLES IN OUR MATERIALS DEPENDS ON THE TIME YOU DEVOTE TO THE PROGRAM, IDEAS AND TECHNIQUES MENTIONED, YOUR FINANCES, KNOWLEDGE AND VARIOUS SKILLS. SINCE THESE FACTORS DIFFER ACCORDING TO INDIVIDUALS, WE CANNOT GUARANTEE YOUR SUCCESS OR INCOME LEVEL. NOR ARE WE RESPONSIBLE FOR ANY OF YOUR ACTIONS. ANY AND ALL FORWARD LOOKING STATEMENTS HERE OR ON ANY OF OUR SALES MATERIAL ARE INTENDED TO EXPRESS OUR OPINION OF EARNINGS POTENTIAL. MANY FACTORS WILL BE IMPORTANT IN DETERMINING YOUR ACTUAL RESULTS AND NO GUARANTEES ARE MADE THAT YOU WILL ACHIEVE RESULTS SIMILAR TO OURS OR ANYBODY ELSE'S, IN FACT NO GUARANTEES ARE MADE THAT YOU WILL ACHIEVE ANY RESULTS FROM OUR MEMBERSHIP, IDEAS AND TECHNIQUES IN OUR MATERIAL. AT NO POINT ARE WE HELD LIABLE FOR ANYTHING THAT HAPPENS AS A RESULT OF YOU BEING A MEMBER. ALL JOINT VENTURES OR OTHER NETWORKING DEALS WORKED OUT ARE BETWEEN MEMBERS AND THE RESPECTIVE JOINT VENTURE PARTNERS. WE ARE NOT HELD ACCOUNTABLE FOR ANYTHING THAT MAY ARISE FROM THAT INCLUDING, BUT NOT LIMITED TO, UNPAID AFFILIATE COMMISSIONS, BROKEN CONTRACTS, ETC.